The Back to the Future II bandwagon frenzy will reach its peak not today but tomorrow with this self-fulfilling prophecy. I don’t know if you still buy or even read newspapers, but you just might buy one this Thursday. USA Today’s 10/22/15 issue will have the same front page that announced Marty McFly Jr.’s arrest, the Cubs winning the World Series and more. 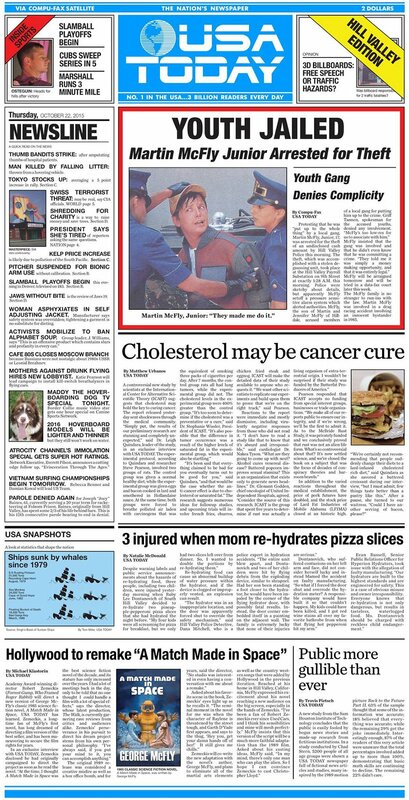 USA Today also said on its Facebook page that the three stories on the lower half of the front page were never in the movie; they were written by BTTF co-creator Bob Gale just for this release.